They say God repairs the brokenhearted. Probably, if the heart break is God initiated, like in the case of Lazarus dying, and his family brokenhearted, so the glory of God may be revealed [Jn.11.14]. But most times he demolishes, not just repairs, what remains standing. And especially, he never repairs man's broken efforts. In the case of Lazarus, God demolished unbelief in his disciples that they "may believe." Redress like that are never accomplished with mere, skin-deep repairs. The remedy should deal with the foundation. Demolishing is foundational. We often think God repairs problematic churches through the revival services we have. We pray for these services well, thinking God would use them to repair the broken lives of believers who fell into sin, or broken relationships gone sour. We imagine God doing a little bit here and there, tinkering with some malfunctioning parts in our lives, and eventually making us whole again. We don't like the idea of God demolishing our entire accomplishments just because of some little things that need repair. We forget the bible truth that God uproots and tears down, and then destroys and overthrows before he builds and plants [Jer.1.10]. That's Kingdom building technology. That's God's ways. It's not his way to just repair. Just look at the temple in Jerusalem. It was his idea to build it, his pet project. He let his glory rest on it. He put his Name there forever. So, it's HIS, not man's. But when man messed it up, no repair was sufficient. God had to destroy it using the Babylonians. When God wants to restore something, he never repairs. He destroys to build anew. God's effort and man's effort cannot go together. It should be God's effort, idea and strength from first to last. Man should be mere tool in the entire process. If man puts any idea or effort into it, God demolishes it and starts anew. And mind you, he never even "rebuilds" man's failed efforts. He may probably rebuild his spiritual projects which man tampered with and ruined, but he never rebuilds man's failed efforts. He totally demolishes them and builds anew his own. God will never finish what he never started. What is born of flesh is flesh. What is Spirit is Spirit. In Nehemiah's and Ezra's time, the temple was not repaired. It was rebuilt. The wall was the one repaired. But there are two kinds of walls in the Spirit realms--God's wall and man's wall. God's wall that surrounded Jerusalem and which was destroyed in the great exile was repaired as per God's instructions. He repaired or rebuilt it because it was his own. God never does that with anything man-made or anything put up by man's "bright" ideas or anything built with man's effort. He demolishes them outright and builds anew his own. 11 therefore tell those who cover it with whitewash that it is going to fall. and in my anger hailstones and torrents of rain will fall with destructive fury. And what was God's solution to the problem? To be sure, it wasn't repairing. level it to the ground so that its foundation will be laid bare. Man's churches and ministries, like church denominations, are all flimsy walls that easily crack. And church people think all they need to do is cover the cracks with whitewash or plaster. So, they hold revival services, summer camps, overnight prayer meetings, and non-stop worships for this--everything man's efforts [though prayed for], not realizing what God wants is to demolish their church denominations and build his own one, singular glorious church, without spot or wrinkle or any blemish, holy and pure. God will destroy both the flimsy wall and those who cover it with whitewash. There's no hint of repair or small touches of improvement in the Ezekiel passage. It's nothing less than total destruction. After that, genuine Kingdom building on earth happens. Yes, God never repairs man's mess. It's got to be God's own DNA stamped on the spiritual project. It's got to be God's flesh. GOD's Flesh E-book. To buy the e-book at a special, lower price (P100), email me at godsflesgblog@gmail.com. The e-book costs P200 on other blogs. 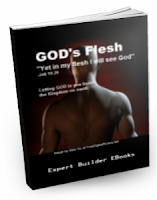 Get God's Flesh short emailed insights regularly when you buy through this email address. The e-book shares radical insights about church and on genuine spiritual revival you probably haven't heard of.